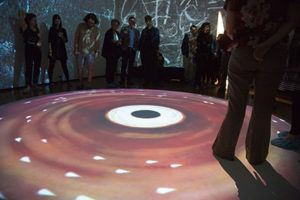 Visitors observe the projection of a black hole simulation, including representation of Einstein’s theory of general relativity, inside the Sesnon Gallery. By Matthew Forman. As ripples of energy radiated from the collision of two black holes, a new one — 62 times the mass of our sun — was created. The collision and its waves stunned astrophysicists across the nation and sparked questions across the globe. The Mary Porter Sesnon Art Gallery held the opening reception for “Black (W)hole” on Oct. 5, an installation designed by the Einstein Collective. The collective is a team of artists, physicists and engineers from Montana State University who collaborated to create an “artscience” piece that allows viewers to interact with and gain a new perspective on the universe. Black curtains covered a separate room within the gallery next to a sign, requesting people remove their shoes before coming into contact with the piece. Upon entering the darkness through the curtains, a projection of a starfield overlaid with Einstein’s theory of general relativity — which forever changed the field of physics by defining gravity as a property of space and time — appears to be scrawled in chalk throughout the room and onto the viewers. Students, faculty and the provost of Porter College mingled around the edges of the room, taking in its beauty, while toddlers crawled across the animation’s glowing orb, hypnotized by the swirling colors. Gallery attendees observe the simulation of two black holes colliding. By Matthew Forman. “I know it’s an image on a gallery floor but you approach that blackness, that void […] you actually feel like you might go in it,” said UC Santa Cruz Dean of Arts Division Susan Solt. The projected design was created by a member of the Einstein Collective and Black (W)hole artist, Sara Mast who was inspired by the equations on Einstein’s blackboard at Princeton. Mast etched these equations using a medium called encaustic paint, where pigments are added to hot wax — in this case oil crayon and panpastel — and then layered onto a surface like wood and molded into a desired shape. Filmmaker Cynthia Stillwell took stills of the paintings of Einstein’s equations and layered them together, transforming the painting into a digital experience. The equations morphed into a star field and continued this cycle. The pink and orange sphere turned into a dizzying neon vortex, exuding bright color as people imagined themselves at the center of the universe. The installation urges people to lose their sense of scale in the dark and “gives a hint of the vastness,” Mast said. Rather than feeling diminished by the vastness of the cosmos, Mast feels larger and “enlivened” by her connection to the universe. The installation was designed to let the imagination of the viewer run wild, creating a foothold for people to better comprehend the happenings within it. Although the black hole wasn’t visible in the animation, a white glow that lined the supermassive black hole was present, representing the trace of the orbit around it. This orbiting process is often referred to as extreme mass ratio inspiral (EMRI), and the end result is the stellar black hole merging into and becoming a part of the larger one. As this process unfolded, a deep hum, like the revving of a motorcycle engine, was broadcast through speakers, an audio representation of the observed gravitational waves. Gravitational waves were radiated at the contact of the collision, ultimately disrupting time and space. Building up to the collision, the orbit of each got smaller and tighter, the speed and volume increasing with it. In September 2015, gravitational waves were detected for the first time, something scientists have worked toward for decades. Laser Interferometer Gravitational-Wave Observatory (LIGO), the biggest national science foundation project in the U.S. dedicated to detecting cosmic gravitational waves, was caught off guard when their detectors got a loud signal called a chirp — the result of two black holes each roughly 30 times the mass of the sun colliding 1.3 billion light years away. As a member of LIGO, Key explained the broader significance of the discovery and why scientists are so excited about it. The waves can help piece together the history of our galaxy and open up the door to future discoveries. Black holes have existed just as long as our universe and gravitational waves serve as evidence. Key acknowledged the value in understanding the mechanics of the installation but expressed the ability to appreciate it no matter the level of knowledge.